A significant advantage of single cell micromanipulation is the ability to control the timing and duration of contact between cells and other surfaces, and also to control the chemistry of the surfaces with which the cell interacts. 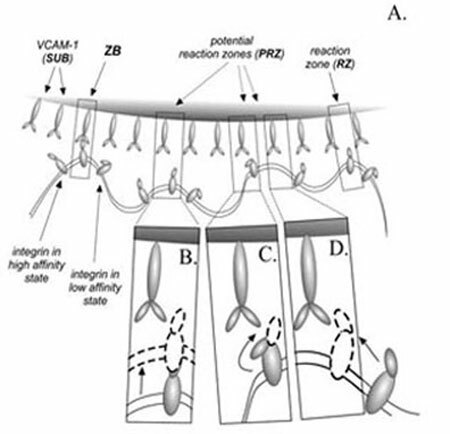 We have taken advantage of this capability, first to characterize the rate at which bonds form between a cell and a surface presenting a specific adhesion molecule, and second, to examine the dynamics of the cell response when it encounters specific stimulatory molecules immobilized on a surface. Figure 1. 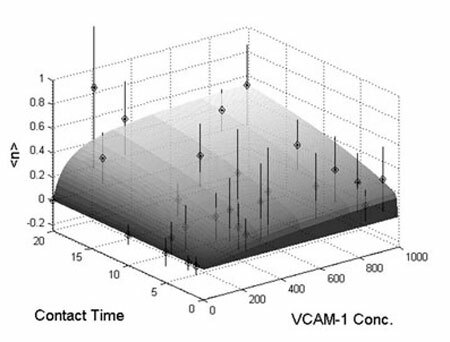 Simple theory predictions fail to match measurements of neutrophil adhesion to VCAM-1. (The solid line was fit to the solid symbols, and the parameters were used to predict results for a different case (dashed line) which fell far from the measurements (open symbols). Figure 3. 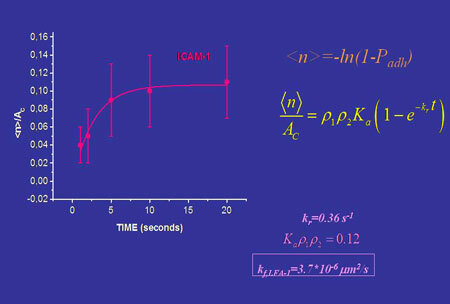 The new theory predicts that the rate of reaction depends on both the concentration of target molecules (VCAM-1) on the substrate and the contact time. 2. Waugh, R.E. and Lomakina, E.B. (2008). 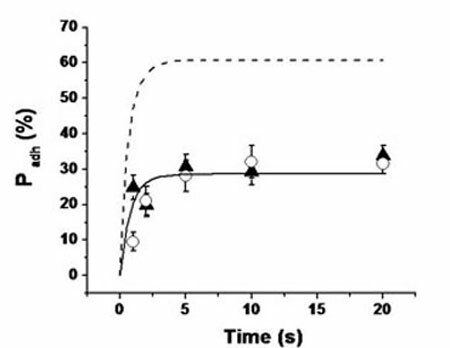 Active site formation, not bond kinetics, limits adhesion rate between human neutrophils and immobilized VCAM-1. Biophys. J. (in press). 3. Lomakina, E.B. and Waugh, R. E. (2008). Adhesion between human neutrophils and immobilized endothelial ligand VCAM-1: Divalent ion effects. Biophys. J. (revised, resubmitted).